An independent inspection of the Four Mile Run bridge connecting South Arlington Ridge Road with Mount Vernon Avenue in Alexandria (see map above) requires closing the west sidewalk to pedestrians, due to deterioration of beams below. Vehicle traffic will not be affected by the restriction. The bridge was built in 1956, along with a “sister” bridge at West Glebe Road, over Four Mile Run into Alexandria. Both are made from the same materials with the same design. Last fall, a special inspection found the need for a weight restriction on the Glebe Road bridge as well as closing its sidewalks in both directions due to beam deterioration. The same issue exists with a beam beneath the Arlington Ridge Road bridge’s western sidewalk. Working with the City of Alexandria, Arlington traffic crews will use signage and barricades to direct pedestrians and bus riders to the bridge’s east sidewalk. A Metrobus stop (10A, 10E, 23A, 23B routes) and entry to Four Mile Run Park and the Four Mile Run Trail are just before the north end of the bridge on the east side at South Glebe Road. Another Metrobus stop sits at the northwest corner of Arlington Ridge and Glebe (10A, 10E routes). 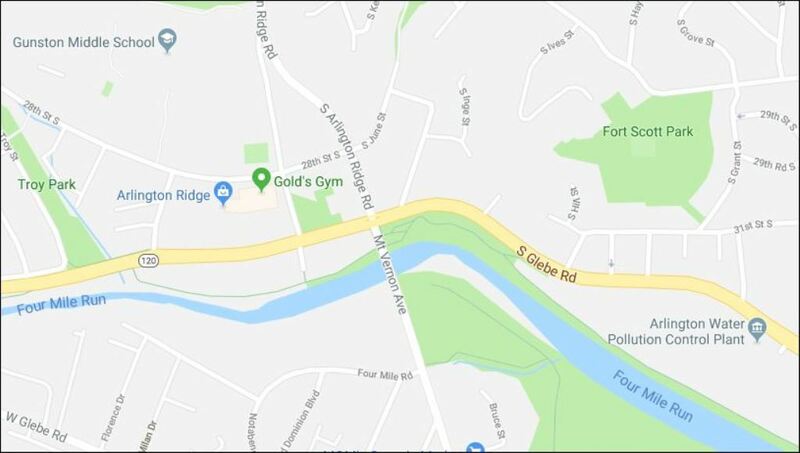 As with the Glebe Road bridge, the restriction at the Arlington Ridge Road bridge will remain in place indefinitely as engineers monitor conditions and look at eventual replacement options. The bridge at Glebe Road is now being inspected formally by third-party engineers every six months. Its sister bridge at Arlington Ridge Road is slated for another third-party inspection within a year in addition to regular County examinations. Per industry standard, Arlington bridges are formally inspected by third party engineers every two years, with regular County safety checks at other times. Verizon FIOS in Alexandria, VA? No.